One night this week, we awoke to loud, repetitive banging on our outside door. There were three guys — one at the door, and two others in a big van. They eventually left. But I was as shaken as my poor door, and we later learned it may not have been just a few guys at the wrong house. It could have been people trying to break in and steal from us, by tricking us into opening our front door for them. That possibility shook me even more. I found myself in a very familiar state: Much Afraid. We usually take our kids outside to play in the afternoon, but that day, I didn’t want to go. I forced myself to walk out the front door. I didn’t want to do it, but I knew if I didn’t go then, that the next time would be even harder. So I picked up my chair, walked over to the neighbor, and sat down to talk with her. We had a lovely time together. We talked about Bible translation, and how long I plan to live in Cambodia. 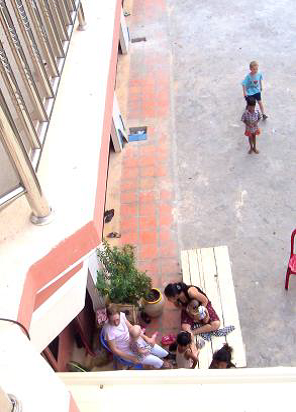 . . We talked about the differences between Khmer and English and French. . . We talked about missing people who are far away from us. . . And we even talked about the night before. To feel such community with a Cambodian — one of the reasons we came here — was very healing for my heart that night. So I’m re-posting what I wrote in last May’s newsletter. I apparently still need those 20 seconds of insane courage. As the following story illustrates, I’ve often needed courage in my life. Toward the end of 6th grade, I heard an announcement for students who were interested in intramural volley-ball during the next school year. I was interested in intramural volleyball. I hesitated. I looked at the door. I watched a sports-y blonde girl leave for the meeting. I wanted to go. I don’t know why I wanted to go learn about intramural volleyball – hadn’t I always been afraid of balls hitting me on the head?? I looked at the door longer. I was afraid to get up out of my seat and go. I was afraid people would know I was interested in volleyball. I was afraid to leave in the middle of elective and miss some-thing. I was afraid if I went I would be stuck in intramural volleyball for-ever even if I changed my mind. My fear became glue in my seat. Even after I knew it was too late to attend that meeting, I looked at the door and wished I had gone. And I have always been so embarrassed that I was embarrassed, that I never told anyone that story. 20 seconds of courage?? Is that really all I need? The young woman who lives next door seems very sweet but shy. I have been thinking, praying, about getting to know her. I know enough Khmer to exchange a few short, insignificant sentences. Last week we were playing outside with our kids one evening. I saw her. I hesitated. Was she staying outside or going back inside? Would she think something was wrong with me if I try to talk to her? I haven’t ever talked to her before. Jonathan knows about my fears and my hopes. He gave me a nod. That nod said, take 20 seconds and go talk to your neighbor! I took a deep breath. I picked up baby Faith. I walked over to the newly married neighbor lady. I said something. I am not sure, but I think I asked her about her baby. I stayed, and we talked a little in Khmer. She talked with her friends in Khmer, too, and I have no clue what they were talking about. It felt. . . uncomfortable. But I did it, I walked from my front door to her front door. A distance that is farther than the sum of its steps. A distance that is truly an ocean apart. With 20 seconds of insane courage. That’s the 3rd verse to a song Jonathan wrote (If you want to listen, you can click here, and then click on “One Thing” to download). Its piercing truth stays with me: now that I’ve gone to the ends of the earth, I must still go down the street.